A letter from Victor H. Metcalf written on July 12, 1904, to Carhart. In the letter, Metcalf thanks Carhart and reminiscences, on letterhead of the Office of the Secretary, Department of Commerce and Labor. 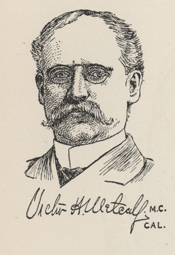 The portfolio of Victor Howard Metcalf contains letters from Elihu Root, U.S. Secretary of War, and G.L. Gillespie, U.S. Army Engineer, relating to request of San Francisco & Piedmont Railway Company in 1902 to fill in a portion of Yerba Buena. Also included is a letter from Victor Howard Metcalf to Theodore Roosevelt concerning question of segregation of Japanese children in California Public Schools raised by 1894 Treaty with Japan, with a photocopy of President Roosevelts reply. Papers: In the William S. Harlow papers, 1885-1904, 3 volumes. Correspondents include Victor Howard Metcalf.